NEW FOR 2017!! Newly Renovated This spectacular OCEANVIEW' 9th floor condominium offers the most 'breathtaking' views of the South Carolina coastline. The unit offers dynamic ocean views from all windows The unit has been completely upgraded in every area, floors to ceiling and is probably one of the nicest apartment at the Sands Ocean Club. You'll enjoy the breathtaking views of the Atlantic Ocean from the huge private balcony accessible from the master bedroom and the family room. The condominium features a nicely equipped kitchen with high end appliances. The master bedroom has a queen bed and a spectacular view. The family room/living room features a matching queen sleeper sofa bed and chair, a flat screen TV with DVD player, dining room table with seating for four to six. The modern Master Bath has a tub/shower. As one of Myrtle Beach's hottest spots (Shore Drive, Arcadian Shores). The resort has something to offer everyone in the family. Guests of the Sands Ocean Club have numerous amenities to enjoy, including lazy rivers, indoor and outdoor pools, hot tubs, sauna, health club and newly opened Atlantis Day Spa for both men and woman's massage and facial needs, outdoor café, live music. 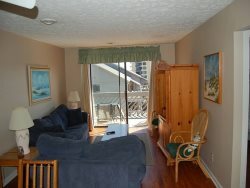 This condo is also home to the famous and popular outdoor cafe featuring outdoor lounge and live music, and much more. An Oceanfront restaurant features casual dining. River City Cafe features a pool-side cafe and deli and offering the best burgers on the beach! A lounge in the lobby of the Sands Ocean Club has a great daily Happy Hour and cocktails and entertainment. There is also a gift shop, convenience store, golf shop and exercise room on premise. The resort is a short distance from Restaurant Row with the House of Blues and Alabama Theater and Barefoot Landing. The famous Shore Drive Area is very safe and private.